This All-in-One Laundry Single Sink Vanity by Stufurhome,embellished in a grey finish,is a masterful combination of simplicity,functionality and charm.The deep rectangular sink,spacious storage and drawers definitely fulfill the needs of modern day living.The porcelain sink and the modern grey finish of the cabinet make this vanity an attention grabber and add a scent of gracefulness to your laundry room. Adds contemporary flair to any space. Includes designer stainless steel and drawer hardware. Allows for easy plumbing and faucet installation*. 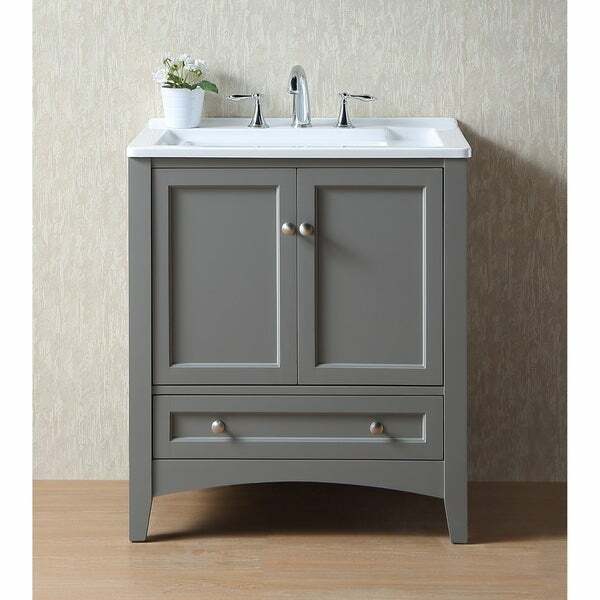 Contemporary single sink laundry vanity with basin cover. Soft closing stainless steel hardware. Drop in style white acrylic sink. Large cutout back for plumbing installation. Dimensions 30.0 In. X 22.0 In. X 36.0 In. Great piece of furniture for your laundry area. Functional and doesn’t look like a typical laundry sink. "what is total width of the cabinet, what is the material of the cabinet?" "How deep is the basin?" "How many holes for the faucet. The picture shows 3 but just want to confirm. " Yes there are 3 holes.